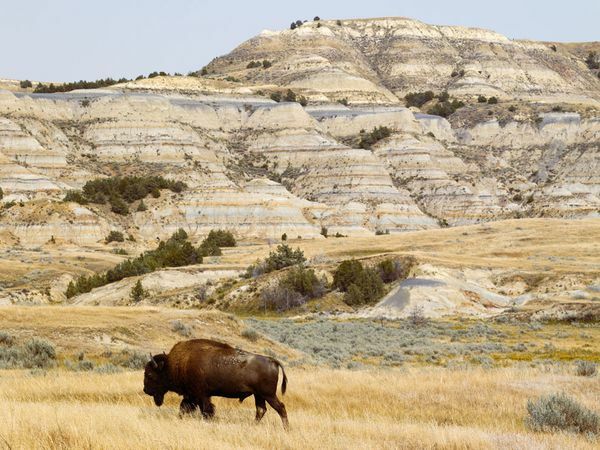 There are many places to visit and explore at Theodore Roosevelt National Park. Visitors can experience firsthand the location of Roosevelt’s Elkhorn Ranch. While the ranch buildings no longer exist, there are interpretive panels installed to give visitors insight to what the area was like in Roosevelt’s time. The ranch is located 35 miles north of the South Unit Visitor Center. The South Unit also features a popular, paved 36-mile scenic drive with stops such as Skyline Vista, Badlands Overlook, Boicourt Overlook and Beef Corral Bottom. One of the most popular activities is to explore the park’s trails — there are over 100 miles of them.The Maah Haah Day Trail, at a whopping 96 miles, passes through both the North and South Units of the park. Only some of the trail passes through the national park. Another popular nature trail is the Riverbend Overlook. This walk leads to one of the most photographed images of the park, a shelter built by the CCC. The walk also leads to a dramatic view of the badlands and Little Missouri River. The park is known for its massive collections of petrified wood and fossils. The fossilized remains of a Champsosaurus were excavated from a hillside in the South Unit. There have bene more than 200 fossil sites discovered in the park. The park is open year-roud, 24 hours a day. During the winter, some scenic drives may be closed due to snow and ice, but road conditions can easily be checked on the park’s website. The park features two campgrounds: Cottonwood Campground and Juniper Campground. Both of the campgrounds cost $10 a night, and $5 a night during off-season. Sites are first-come, first-serve. For those traveling with horses, the Roundup Group Horse Campground is available. This site must be reserved in advance. Backcountry camping is also available, but visitors must obtain a free permit first and can camp no longer than 14 consecutive days. Visitors should bring their own drinking water, for there are no potable water sources in the backcountry. For those who do not wish to camp, lodging is available in Medora and other nearby communities. There is no food inside the park. Restaurants and grocery stores can be found in Medora and Watford City. The park is home to many native species such as elk, bighorn sheep, and bison. Since the inception of Theodoore Roosevelt National Memorial Park in 1947, all of these species have been successfully reintroduced. The park is fenced in, prohibiting the travel of bison, feral horses, and cattle outside the park’s boundaries. Other animals may jump over or climb under the fences. Because of the absence of many natural predators, the park closely maintains and manages the animal populations in the park by studying the diets, movement and distribution, and reproduction rates of the animals. In the past, elk have been transferred from the park to other areas in North Dakota, South Dakota and Kentucky that are trying to reintroduce and increase elk populations. Feral horse populations are maintained at about 70 to 110 horses at a time, to give visitors the feel of what the area was like during the ranching era of Theodore Roosevelt. Surplus horses are sold at public auctions. It is believed that some of these horses are the descendants of the wild horses of the 19th century. Their similarities are striking, with larger heads and shorter backs than modern horses. The park was established in remembrance of Theodore Roosevelt, the 26th president of the United States. Roosevelt maintained a relationship with the North Dakota Badlands and the National Park Service throughout his life. He first visited the badlands in 1883, and fell in love with the rugged country. He immediately invested in a local cattle operation called the Maltese Cross. Following the death of both his mother and his first wife, Roosevelt purchased a second cattle operation, Elkhorn Ranch. Here Roosevelt reinvented himself; he learned to ride horses, rope cattle and hunt. It was here he earned the nickname “Cowboy of the Dakotas.” If it weren’t for the brutal winter of 1886, who knows how long Roosevelt would have continued his life as a cowboy? After the winter killed off all his cattle, he returned to New York. Following Roosevelt’s death in 1919, the badlands were explored for possible park sites. After undergoing many name changes and roles, the park was officially established as Theodore Roosevelt National Park on Nov. 10, 1978. 1883 – The Marquis de Mores establishes the town of Medora. 1934 – The CCC arrives in the North Dakota Badlands area to build roads and shelters. 1935 – The area is established as the Roosevelt Recreation Demonstration Area. 1946 – The recreation area is transferred to the United States Fish and Wildlife Service and renamed the Theodore Roosevelt National Wildlife Refuge. 1947 – President Harry S. Truman establishes the Theodore Roosevelt National Memorial Park. 1978 – The park’s boundaries are reconsidered, 29,920 acres are added, and the park is reestablished as Theodore Roosevelt National Park. Click to see a Theodore Roosevelt National Park South Unit Overview map. Click to see a Theodore Roosevelt National Park North Unit Overview map.